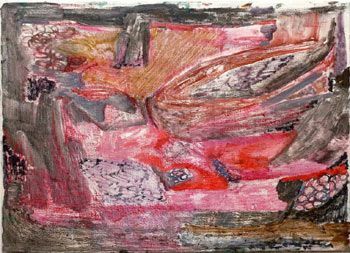 This first one person show in a public gallery in the UK allows an in-depth look at Varda Caivano?s recent small-scale oil paintings. Caivano is part of a group of young painters now working in London. 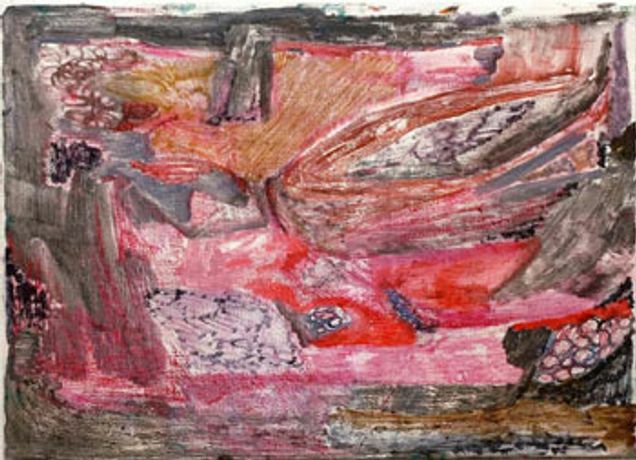 Her work contains an intriguing mix of abstraction and figuration so that in some paintings landscape and organic forms are evoked, while in others, interlocked elements jostle, connect and dissolve. Caivano deliberately keeps her work in creative flux so that it is open to interpretation and avoids the habits of a signature style and premature resolution. She deftly exploits formal traits to improvise imaginative possibilities for the representation and exploration of an otherwise hidden internal life. The quality of surface in these paintings is also key to giving them a specific character. The paintings are built up thinly, and sometimes scraped back in areas to the weave of the canvas. There is a veneer of awkward fragility conveyed through the scale, subtle tones and paint application that partially conceals something intense underpinning them. Caivano?s application of paint appears, in places, as if it were a fleeting stain or something rubbed away to create a palimpsest revealing earlier states of the work. Revision, doubt and memory are an intrinsic part of Caivano?s visual economy that draws in viewers to calibrate themselves to these restless but authoritative paintings. There resides in all her work a stubborn and rewarding concern for originality and authenticity. The paintings contain both what is needed for resolution on their own terms and a sense of the artist?s experience of being in the world through building on art historical accomplishments. These include Caivano?s strong connection to the history of improvisation in both visual art and music and a palpable relationship to craft that reflects the fruitful combination of discipline and freedom in her work. Varda Caivano was born in Argentina in 1971. She studied Art History (BA) at the University of Buenos Aires from 1994 to 1998, a Post Graduate Diploma in Fine Art at Goldsmiths College, London, from 2000 to 2001 and completed an MA in Painting at The Royal College of Art, London, from 2002 to 2004. She lives and works in London and is represented by Victoria Miro. This exhibition is a collaboration between Chisenhale Gallery and Kunstverein Freiburg. It is accompanied by a full colour catalogue with essays by Felicity Lunn, Director of Kunstverein Freiburg and Simon Wallis, Director of Chisenhale Gallery.